There are never-ending reasons why couples choose to get married during the summer – it’s warm, it’s sunny, and it’s generally just a happy time of year no matter where you live. During the summer, however, there are extra precautions that the bride (and her guests!) need to take in order to stay happy and healthy throughout a hot summer wedding day. Keep all of the summer wedding planning tips following in mind as you plan your soiree. This is probably the most obvious product for summer brides not to forget, but it’s also the most often overlooked. You’re most likely going to be under the hot sun for a majority of the day for photos – apply sunscreen all over, including your face, lips and ears, before you get dressed, and have one of your bridesmaids pack an extra bottle or two to reapply throughout the day. It’s easy to get caught up in all the excitement and emotion of your big day and before you know it, you realize that you haven’t had anything to drink in hours. Water is an absolute must throughout your wedding day; fill a large, reusable bottle before you leave your get-ready location to have with you or one of your bridal party members throughout the day – they also should be reminding you to take a sip here and there! And, although it’s okay to sip champagne and cocktails during the reception, make sure you substitute a glass of water here and there so you aren’t left feeling light-headed or sick from the heat. Just like staying hydrated, summer brides especially need to remember to eat to avoid feeling fatigued or light-headed. Veggies and fruits are great snack options because not only will they satisfy your appetite, they also are packed with water and antioxidants that will keep you looking fresh and glowing all day. Whether you are doing your own wedding makeup or having it applied by a professional, make sure you discuss options for sweat-proof, long-wear foundation. Foundation serves as the base of all your other makeup, so if that fails, the rest of the makeup will follow suit. A face primer and eyelid primer also will help extend the longevity of makeup wear and time between touchups. Be sure to pack blotting papers and loose, translucent setting powder to keep the shine away throughout the day, and you also may consider packing a facial mist, such as the Evian Facial Spray – it will help freshen up your makeup and give you a nice cooling effect! The bright sun can be damaging to your eyes, so don’t forget to protect them too on your wedding day! In between photos, be sure to pop on a pair of your favorite stylish frames to keep your eyes protected but still look good. 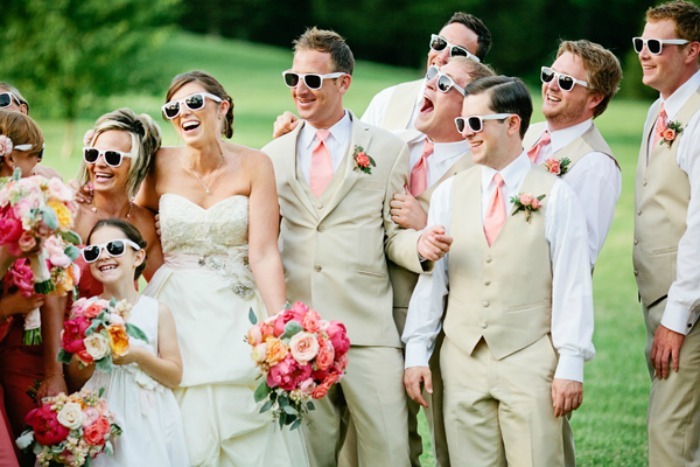 You even could turn sunglasses into a prop for the entire wedding party and get a few fun snapshots. In sweltering heat, flowers are bound to wilt and not last very long. Talk to your florist about having a few extra blooms available, such as backup boutonnieres for the men and extra blooms to swap out of your or your bridesmaid’s bouquets, to keep everything looking fresh and pretty for photos. Summer weather can be highly unpredictable, and a summer rain shower can pop up at any time. You will be at peace and happier if you’ve discussed a backup rain location with your photographer ahead of the big day. Bringing along umbrellas can’t hurt either – and, if it doesn’t rain, you can use the umbrellas as extra shelter from the sun! Let’s face it – we’re all human, and we all sweat. Summer brides that have to wear a long gown with special undergarments and have all the attention on her all day long may even sweat a little more than normal. Consider purchasing two pairs of whatever undergarments you plan to wear with your dress – you probably will feel relieved when your Spanx are sweaty and sticking to you that you have an extra pair to change into. Most brides don’t want to wear their heels all day long, but summer brides especially need to let their feet breathe to avoid swelling and sweating! Pack a pair of cute flats or sandals to change into as soon as you’re done with photos (or, when you’ve had enough of those heels). If you’re having an outdoor wedding or plan to be outdoors throughout the reception, make sure you apply bug repellant. Bug bits and mosquito welts are not what you imagined for your wedding photos! You also can ask your reception venue if they would be willing to put out citronella candles or tiki torches to help keep the bugs away. Don’t forget about your guests, too! You can have a hydration station set up with water, lemonade, etc., as well as baskets of hand fans, towels and extra sunglasses to help keep your guests cool and happy to be in the sun. Because ultimately, happy guests will lead to a happier you and wedding day! Were you or are you going to be a summer bride? What advice do you have that brides shouldn’t forget on their summer wedding day?